Made in England, United Kingdom, Europe, 1967-1971. Between 1969 and 1971, four Black Arrow rockets were fired at Woomera. The Black Arrow was a British satellite launch vehicle developed in the late 1960s after the UK withdrew from the European Launcher Development Organisation. It was intended to provide Britain with an independent capability to launch its own satellites. The final Black Arrow placed the satellite Prospero into orbit, the second and last satellite to be launched from Woomera, in 1971. 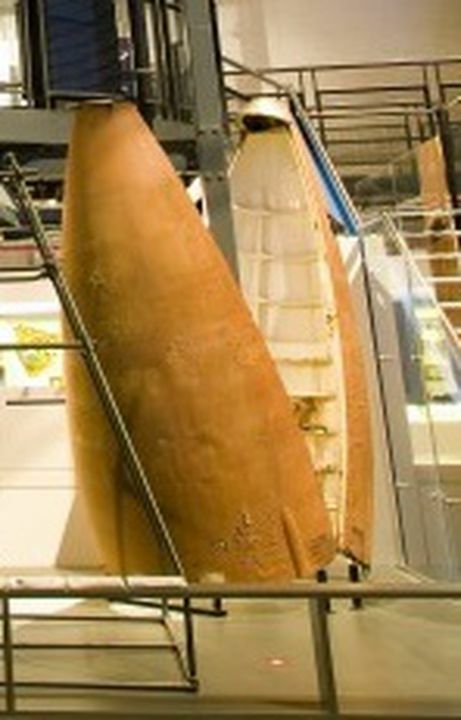 Rocket nose cone, payload fairing, 2 pieces, used on a Black Arrow rocket, Woomera Rocket Range, South Australia, metal/ fibreglass, Royal Aircraft Establishment /Westland Aircraft, England, 1967-71. Black Arrow rocket two-piece nose cone payload fairing, hinged on the vertical axis. The payload fairing covered the satellite at the top of the rocket to protect it from the stresses of launch. It formed a bullet-shaped nose cone for the rocket and was hinged to open and fall away, freeing the satellite to be released into orbit. Originally bright red, the colour has faded to orange due to exposure to the desert sun. Each half of the fairing has an external cladding of fibreglass(?) over its metal body, the interiors painted white to assist in temperature regulation. One half of the fairing is surmounted by a small hemispherical cap which covered the top of both halves when the fairing was closed. It is pierced by two umbilical ports for pre-launch connections to the satellite, and also has 2 telemetry aerials and two other similar fittings. Some wiring is also still present. The external coating of this half of the fairing shows a major body crack, like a blow, presumably from impact with the ground after it was jettisoned. The second half of the fairing, lacking the connecting cap, also has 2 telemetry aerials and signs of an additional two (as in the other fairing), although one of these is missing. Some wiring is also present. The Black Arrow rocket was designed by the Royal Aircraft Establishment (RAE) in the UK. Components for the Black Arrow were manufactured by several different British aerospace companies. The fairings may have been manufactured by Westland Aircraft on the Isle of Wight, which manufactured the structure of upper stage of the vehicle. A manufacturing date on the wiring in the uncapped fairing, suggests that it was manufactured in 1967 The vehicle may have been assembled as a whole in 1969 or 70. If the identification with flight R-1 is correct, the fairings would have flown in 1970: however, they could have been launched as late as the last Black Arrow flight in 1971. This item came from the collection of the Rohrlach Heritage Gallery, a private museum in Tanunda, South Australia. The Rohrlach Collection was assembled by Kevin Rohrlach, a South Australian businessman with a passion for collecting technology. It was a major tourist attraction in the Barossa Valley area for about 30 years. Mr. Rohrlach died in 1998 and his widow closed the museum and put the contents up for auction in 2001. The auction was held on site on October 6-7, 2001. In the 1970s and 80s, as the Anglo-Australian Joint Project at the Woomera Rocket Range was winding down, Mr. Rohrlach salvaged various items of aerospace hardware from the Woomera Rocket Range and downrange pastoral properties. According to its display label, the nosecone was found on Millers Creek Station about 200kms north west of Woomera. Interviews with the wife of the station manager in the 1970s and his successor give no indication of when Rohrlach might have acquired these items, although he is unlikely to have removed them without the manager's permission. This object is currently on display in Space at the Powerhouse Museum.